A few months back, there was a competition on ClubAlpha.net, Sony’s official Alpha forum. Take a picture of yourself with the A100, it said. 40mm F36. This time, the Dynax 7’s back was opened and it was set to a 10 second exposure (to give me enough time to get into the reflected frame.) 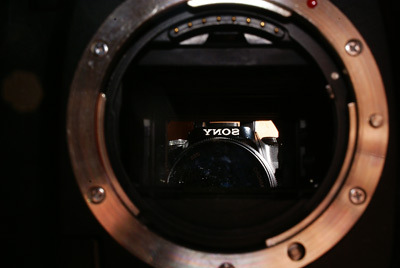 The apparent mirror in the frame is a real mirror held to the back of the camera! Needless to say, I didn’t win anything because I wasn’t (apparent) in the shot, or the camera wasn’t in the shot. This entry was posted in Geek, Pictures on November 1, 2007 by 2konbla. Technically, it looks cool. The only way I could achieve having more of my face in the second shot is to be really far from my reflection with a telephoto… but then I’d need to stop down so that the mount and the reflected me are in focus, which for some reason could never work. 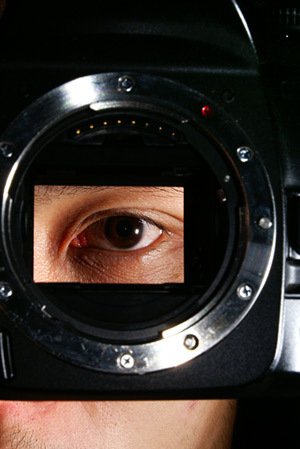 Thus, this shorter focal length gets me and the mount in relative clarity. How about trying with your fisheye? I would have to be almost touching the mount to get it decently filling up the frame… then the mirror would have to be further away so I can see myself in it. Ironically, all I’d see is the fisheye pressed against the mount, in the mirror!